Hollywood is Dead » STEALTHISART.COM OFFERS NEW CORPSE WARS PRINT! STEALTHISART.COM OFFERS NEW CORPSE WARS PRINT! For the first time ever, notorious Online art dealer, StealThisArt.com, is offering an exclusive Hollywood-is-Dead art print! 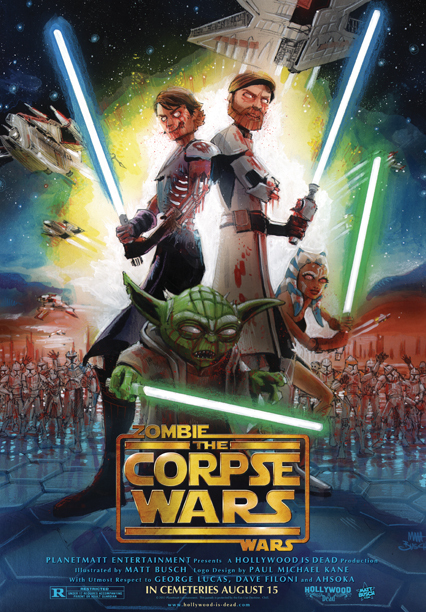 Illustrated by Matt Busch, as if you were expecting someone else, this zombified movie poster returns to the gruesome galaxy with ZOMBIE WARS: The Corpse Wars! In the midst of intergalactic turmoil, an infectious virus has overcome alien worlds, leaving everyone for dead- only to rise again! Zombies, alien zombies, and even clones of zombies… What more could you want from this undead spin on the sacred saga? This is a rare opportunity you need to jump on fast! These will only be offered at StealThisArt.com today, and there will only be 100 copies printed! Go and steal this incredible Hollywood-is-Dead box office cadaver now!